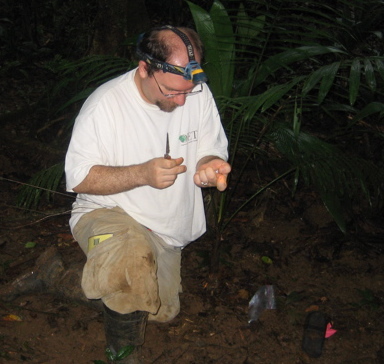 TM: I’m Terry McGlynn, and I work on the experimental natural history of rainforest ants. I’m a parent and a spouse. I also teach, mostly with students from backgrounds underrepresented in the sciences. TM: You know how some kids just love to play with bugs and never grow out of it? That’s not me. Of course, ants are amazing, but I didn’t really appreciate that when I was younger. I had a great class in Insect Biology in college, and when I realized I was into the evolution of behaviour, I gravitated towards ants. TM: Gypsy ants, Aphaenogaster araneoides. If you watch them move about, they’re just the most charming creatures. They also have a very curious behaviour – their gypsy habit — that has been a side project for the last fifteen years. They remain a puzzle that I wish to solve. I love that they keep me guessing. TM: I do my best to savor the little moments. For example, I couple years ago, I stopped what I was doing to watch a leafcutter foundress (Atta cephalotes) excavate a brand new nest. The odds against her were extraordinary, of course. But, to observe the modest beginnings of what may become a monumental endeavour was a good lesson. I watched her for 45 minutes. Depending on your perspective, that duration could be a flash or it could be an eternity. As for a research discovery, those almost always happen at the computer, when I’m going through results! The most recent exciting one that comes to mind was when I discovered a very simple predictor of caste ratio in Pheidole. You’d think that something as simple as body size couldn’t predict caste investment throughout the whole genus globally. Discovering a new and simple generalized pattern is exciting, mostly because it teases entirely new avenues. TM: Teaching is a huge part of my work – my employer is definitely more focused on teaching than research. 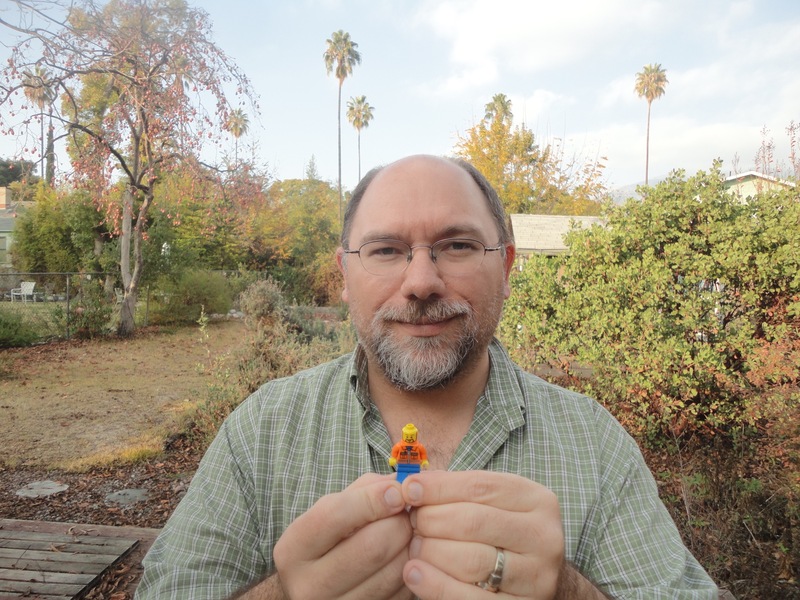 In the past year, I’ve taught biostatistics, and run classes supporting K-12 science teachers. I also have joined others to teach the Ants of the Southwest field course in Arizona, focused on the integrative biology of ants. Come to think of it, I do think that thinking about the relationship between cooperation and conflict in social groups of ants has helped me think about how my classes run. Effective teaching requires opportunities to cooperate, and respectful relationships with students minimize conflict. TM: I just read Eyrie, the latest novel by Tim Winton. It was good, but I’d recommend other ones from him first (The Riders, Cloudstreet or Dirt Music). Science-wise, I recently finished Harry Greene’s memoir, Tracks and Shadows. If you want to know how you can build a career that emphasizes natural history and basic discovery, then Harry Greene explains how he did it. I don’t think what he did can work for most of us, but it’s still a good story. TM: I have no choice but to point to Hölldolber and Wilson’s The Ants. It was relatively new when I started grad school, and it was the authoritative tome. Of course the massive amounts of information affected how I thought about ants in so many ways. More important, however, the fact of the book itself affected me. It just floored me, that notion two people could fall in love with ants so much that they would go to the trouble to create such a thorough and gorgeous product in homage of their beauty. That book is a tangible manifestation of academic passion. TM: I like to hike in beautiful places, read literary fiction, travel to new places, visit museums, and I’ve started running months ago. A silly hobby involves the official Historical Landmarks the state of California — there’s about 1,000 of them. When I come upon one, I make sure to get a picture of the historic plaque. I might go out of my way a little bit for one if I have the time. I’ve probably visited a couple hundred by now. TM: I don’t know. I just keep going. And I have been through tough times, career-wise. It helps to make sure that you continue to sleep enough, eat well, and keep moving. Physical inactivity amplifies stress. The support of people who care is important. TM: I’d need to be able to read and to write. So, I guess, a really good book, a computer, and maybe a coffee press? Because coffee. TM: My undergrad advisor, Beth Braker. Even though I was a middling student in several dimensions, she invested concern in me. Because of her, I ended up working on insects in the tropics, and she remains a valuable mentor and friend to date. She’s been a remarkable model as an academic parent as well. She provides an exemplary counterbalance to the tragically pervasive notion that undergraduates are less important than other scientists. TM: We don’t even understand what causes gravity, much less understand what happens within and among social insect colonies. Organisms and biological communities are far more complex than gravity. If a mystery is worth solving to you, then I think it is worth solving. If you’re excited by it, that’s enough. That said, the pursuit of mystery is secondary to health, happiness, and employment.